July 1935 We met July 23-1935 at the home of Mrs. Ed Lincoln Jr. at 1900-4th ave., with a program and a potluck picnic. The president, Miss Butler, presided. The song, this is my father's world, was sung; Devotions were by Mrs. Robert Lincoln, who read about the [plowman?] tries to keep his rows straight by looking at a fence post, he must not look back, because where he looks forward again he might sight a different post. The devotions closed with prayer. Minutes of the June meeting were read and approved. 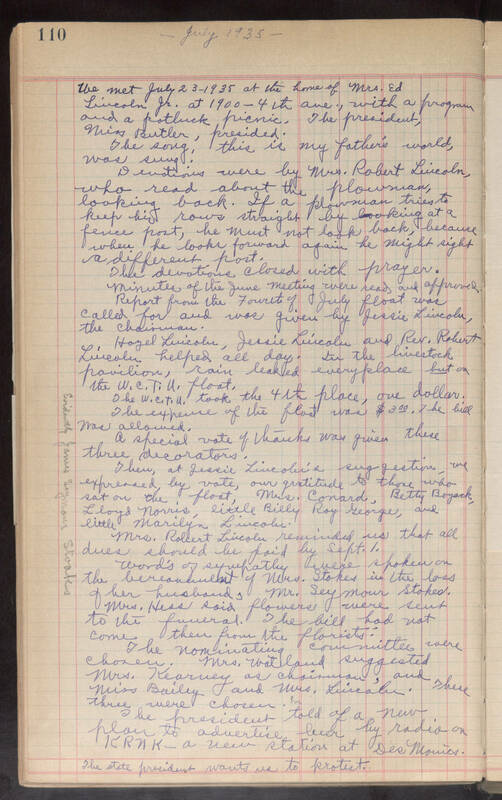 Report from the Fourth of July float was called for and was given by Jessie Lincoln, the chairman. Hayel Lincoln, Jessie Lincoln and Rev. Robert Lincoln helped all day. In the livestock pavilion, rain leaked everyplace but on the W.C.T.U float. The W.C.T.U took the 4th place, one dollar.The [illegible] of the float was $3,00. The bill was allowed. A special vote of thanks was given these three decorators. Then, at Jessie Lincoln's suggestion, we expressed, by vote, our gratitude to those who sat on the float, Mrs. Conard, Betty Boyack, Lloyd Norris, little Billly Roy George, and little Marilyn Lincoln. Mrs. Rolcert Lincoln reminded us that all dues should be paid by Sept. 1. Words of sympathy were spoken on the [illegible] of Mrs. Stokes in the loss of her husband, Mr. Seymour Stoked. Mrs. Hess said flowers were sent to the funeral. The bill had not come their form the florists. The nominating committee were chosen. Mrs. Watlaud suggested Mrs. Kearney as chairman, and Miss Bailey and Mrs. Lincoln. These three were chosen. The president told of a new place to advertise beer by radio on KRNK-a new station at Des Moines.The state president wants us to protest.